Go for striking sporty style and functionality, with this bold blue silicone strap watch by Lorus. Featuring a bright blue dial with gold tone accents, chronograph, date window and tachymeter bezel, along with 100 metres water resistance. 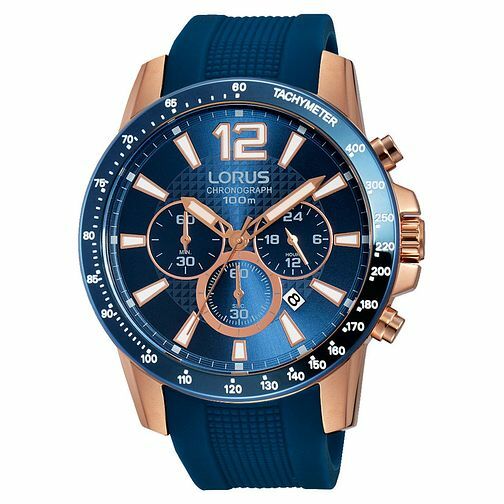 Lorus Men's Chronograph Blue Dial Blue Silicone Strap Watch is rated 5.0 out of 5 by 2. Rated 5 out of 5 by Anonymous from Stunning watch Looks great,bought it for my husband for Christmas he loves it. Rated 5 out of 5 by Anonymous from Striking watch Sporty look. eye catching. Great silicone strap. Also 100metrea water resistance. Bought this as a gift for my husband. He has the watch in black too. Everybody comments how striking it is. Very comfortable to wear.